works great.. except for one problem.. It only recognizes my account. I have 2 users and use the fingerprint reader to switch betwen desktops. When I login to her desktop, the fingerprint reader still has me as the registered user. Is there some way to add info to the registry so it knows there is a second user? Hi Ken, I haven't tested this out with multiple users myself - thanks for the report. I will try to reproduce the problem this week and will let you know what I find. Many many thanks for this, it does sort the problem out of running the microsoft fingerprint scanner in Windows 7 32bit. Well done on some good work. Ken, I'm pleased to report that getting multi-user support to work was an easy fix. Just follow the instructions in Step 5 for DPConsol.exe, as you already did for DPAgnt.exe. Then sign in to the additional account(s) and re-run the "Fingerprint Registration Wizard". You can open it by right-clicking the icon in the notification area, if it doesn't come up for you automatically upon login. I have also updated the post above with this change. That worked perfect, thanks again!. Hey Blogfeld, I have the MS keyboard with the built-in fingerprint reader. Is there anyway I can get the reader to work on Windows 7 64 bit?? Thanks in advance. I think 64-bit users are out of luck. As far as I know, no one was even able to get the Microsoft Fingerprint Reader (standalone or keyboard/mouse combo) to work in Vista 64-bit. I suggest 64-bit users (those located in the U.S.) request the refund mentioned at the end of the post. Thank you very much for this info. I have rheumatoid arthritis and it was very important to get this fingerprint reader working and with this article, it works great! I did all this however I can not register a fingerprint, can you help? Thank you so much it works ! anonymous : i couldn't register because i played with the fingerprint reader before launching the assistant. After a reboot , i directly logged with the kkeyboard and the assistant launchs in the beginning of the session and worked ok ..
almost worked up to the point where i was installing the digitalpersona. the problem is i have an hptx2110 with an integrated fingerprint scanner so when it asked me to plug it in i couldn't because it already was. I followed the intructions and it installed fine however is will not register any fingerprints in the registration wizard! Any solutions? 2. Did you do a clean install of Windows 7, or upgrade from a previous version? What was the previous version (Vista, XP)? 3. Are you already familiar with the fingerprint reader and software, or is this the first time you're trying it out? If you are having trouble registering fingerprints, first double-check that you've completed Step 5 correctly. 2 days leter I figured out how to make it work on my computer (hp TX2110us, a tablet pc with an integrated fingerprint reader and 32 bit vista OS). I beleive this problem is specific to Vista 32 bit systems with integrated fingerprint scanners but either way i hope this is helpful. I did perform all of the above instructions which almost worked up till the digitalpersona pasword manager assumer my fingerprint scanner was an external device and asked me to connect it. If you already performed the previous procedures you will need to uninstall digital persona password manager first. I had to reload 2 Vista DigitalPersona files in order. the second is "DigitalPersona Fingerprint Software for Microsoft Windows Vista (32-bit)". if DigitalPersona password manager is still installed this program will fail to properly install. Afterwards the digital persona password manager installs itself and your fingerprints may be enrolled. I hope this post may be helpfull and thank you Blogfeld for pointing me in the right direction. I cant thank you enough. This may also interest a lot of you: http://www.fatwallet.com/forums/hot-deals/924746/?start=280 - microsoft are dishing out compensation for not supporting their product! Fella, you'll need to provide a bit more information to go on. Please start with the checklist I posted a few comments above. Thank you very much for this most helpful information. Method one with Ultimate did not work for me. Method two worked like a champ the second time I tried it. Anonymous: You must follow the directions exactly as written. If you don't do everything exactly as written, it will not work for you. I don't know what went wrong the first time I tried it, the software installed okay, but fingerprints did not register. I am using 7 Ultimate & had to use the 3b instructions because PCA kept poping up. Also in step 4 "Run this program in compatibility mode for", I have three different options for Vista. (Windows Vista, Windows Vista Service Pack 1 & Vista Service Pack 2). Which one should I be choosing? I tried Windows Vista & Windows Vista Service Pack 2, in which both worked, but I was unable to register any finger prints. I uninstalled it & will try again from scratch. I did notice after uninstalling it & rebooting that the driver is still installed under the device manager. Maybe now the program will properly install. Still cannot register any finger prints. Software is installed, finger print reader is lit up, but it will not register any finger prints. Any sugestions? Thanks. Men, this is a great tutorial, very simple, well explained and the end result is: IT WORKS GREAT!!! Maybe people could get a shortcut by just installing from the MSI file we all guys already modified with Orca :) I will test a shortcut on my laptop wich also has a fingerprint reader, thanks! I have simplified the post to remove Step 3a, based on feedback. The former Step 3b is now just Step 3. I was unable to try that method myself because I have a different edition of Windows 7, but multiple users reported that it didn't work. i have a problem.."to enable the fingerprint reader you must plug the usb connector into your computer's rectangular usb port now"
everything went ok,finger print lights up...but as someone else,i cant register finger print,it always gets the (?) on the icon when trying to register.I am using the micorsoft keyboard with finger print reader. Vale, these instructions are not for HP notebook integrated fingerprint readers. Sorry. Just wanted to say thanks... this helped a lot. Works lika a charm !!! 2. Did you do a clean install of Windows 7 - Yes 32bit. ..first double-check that you've completed Step 5 correctly - verifed. Any Ideas. Thanks though for getting me this far. Jim. I did have the same problem. Will not able to successfully get the 4 scans completed. I uninstall and reinstall again and it works. I think the 1er time I try to register before making the post installation changes. It works great. Thanks. I also call microsoft and they are sending me the check. I hope and don't have to mail the reader now that it works. It works again in Windows 7, great! But the quick-links I set can't take me to the target web pages. Perfect !! Thanks a lot !!! On Windows 7 Intégrale Edition (French). Boy, I must be pretty laim. It all goes well til I get to step 4, Then cant find the modified file. Was really hopping this would work for me, as I have gotten in the habit of real long passwords for security reasons. First... thank you very much for your time! I completed steps 1 through 3.4 however when I attempt to open the modified .msi file I receive an error message "Installation cannot continue due to the following problem(s): - Windows XP 32 bit or Windows Vista 32 bit is required". Forgive me if I have misunderstood but can this not be achieved with windows 7 64 bit? Excellent step by step!! I can use my FP to log into windows 7 but it does not work with Explorer 8. Have you tested it with Explorer 8? - DPagent.exe is being loaded at windows startup (put it in the windows startup file, if all else fails). Also, I'd like to thank a hole bunch to this blog, for finding this solution. It sure helped a lot! i had the same problem where it would not register a finger print. i clicked on the hand, right index finger and it brought me to another screen. it prompts you to scan your right finger 4 times then it registered. did the same with the left index finger worked fine, allowed the install to complete and was able to use in IE8. I just want to know if i can share this post on my blog, by translating it in french, because i think it can be very useful. Hi lucky, you are welcome to share a translation of this post, but please provide a link back to the original article. Thanks. I hope this will work fine with me. i haven't tested it yet, My OS before was XP and have an upgrade with windows 7 32 bit. TIA to the blogger.. Remember to contact Microsoft and ask for a refund. I got my $39.95 check today. (It's not that it won't work, just that they refuse to support it.). had the similar problem on installing DPPM201 under brand new Windows7(32bit), changed from XP to Win7. Hardware is the desktop MS keyboard with built-in fingerprint reader, used for certain years now - won't like to throw it to the basket. Thanks for this post, I've created an MSI that will do all the steps while installing the driver and software for the Microsoft Fingerprint Reader. You shpuld get a trophy for being the first one solve this problem. Someone know if Microsoft Fingerprint Reader, works with this version? Did install Paulo Santos "new" MSI package and it works fine. I've followed your instructions exactly and everything seems to install fine. The problem is when I touch the sensor, I get a User Consol pop up saying "catastrophic failure" and a DPConsol window saying "DPConsol module has stopped working". I have a Microsoft Keyboard with Fingerprint reader, Windows 7 (7600) clean install. I've used the keyboard with a previous intall of Vista. I have run everything as instructed but when I try to register a finger it just gives you the beep that it didn't work. I have tried many times same thing. Any Ideas. Works like a champ in Win7!...Thanks! Hello All: Well i went over this time and time again, and when it comes to regs, a print wont go any further, and i did it step by step many time, and other ideas to try?? Thanks for that. Was quite desperate for some time because I like the convenience of the sensor for logins. (a) It required one extra reboot. (b) Upon reboot I get a compatibility dialog. I select "run" and "don't bother me again" and all appears to be well - at least as far as registering fingers goes! This fix ranks right up there on the "Jim H's, Hot Smokin' Weapon!" scale. Re: Why M$ won't support Fingerprint reader on 7. I had a nice long talk with the folks at Supplemental Product Support and, (doing a bit of reading between the lines), the cause comes down to one thing - money. Just in case you don't know - the Microsoft Fingerprint Reader isn't *REALLY* Microsoft's fingerprint reader - it's Digital Persona's fingerprint reader, licensed by and rebranded for Microsoft. I suspect that Digital Persona wanted a broader market exposure - so they contracted with M$ to license their product. I also suspect that - within certain limits - it did well and now Digital Persona has their own line of "personal" fingerprint readers - almost *EXACTLY* like the M$ ones. Except instead of $40 each, they retail for $80 apiece. Something broke-down between them - maybe D.P. wanted their market back and "offered" to license it for insane money - which M$ rightly refused, or M$ wanted to eat D.P. 's lunch, which D.P. rightly refused. The bottom line is that M$ cannot and does not re-license D.P. 's stuff any further than Vista 32. And I suspect that the ONLY reason that happened is because there was a prior agreement when D.P. walked away, and M$ was gonna take 'em to court and sue their socks off. Note that I don't know that *any* of this is absolute fact, but my suspicions strongly favor it. Hi Jim, thanks for the feedback. You are more than welcome to post a link or excerpt of these instructions elsewhere, but please do not republish them in their entirety. I think that your suspicions about the Microsoft / DigitalPersona relationship are probably spot on. Certainly MS could have obtained new versions of the driver from DP, but chose instead to pay refunds instead for unknown business, financial or inter-company political reasons. Yes, familiar with the fingerprint reader & software. Had done an upgrade from Vista w/SP2 and reader worked before the clean install. Red scanner light is working but will not allow me to register fingerprints. Get a question mark in the right hand corner of the desktop. Have uninstalled and reinstalled same problem. Haven't see this problem posted here yet. Everything works as expected except I am unable to logon to my account with the fingerprint reader (using the Microsoft standalone version with Windows 7 Pro). Fingerprints are registerd with no issues and all is up and running, but when I restart (or shut down), the fingerprint reader light comes on once Windows boots, but when I touch it, I'm told it's a "bad login" or "bad password" and it won't let me login. Any ideas? I am having the same problems as Vale is. I have the Microsoft Fingerprint Reader USB running on Windows 7 Home Premium 32-bit on a clean install. I have used this software previously in XP Pro and XP Home. During the install process (and I have used both the Orca method and the installer from Saulo), my fingerprint reader is plugged in as advised. However, it stops about 3/4 of the way through the installation telling me to plug in my reader to the USB port at this time. My USB ports work, and I have tested the reader on another PC. The reader light is lit up when I plug it in as well. However, no manner of plugging, unplugging, uninstall/reinstall will recognize this reader. What should I do? fingerprint reader works for everything, and it always recognizes me, except whenever i try to logon to widnows at the logon screen, it says cannot logon: unkown user name or bad password, whenever i scan my finger, i tried reinstalling and making sure i typed the right password in but it still doesnt work. Ok i have the problem as many other have.. I folloed the step's exactly as it is said, rebooted twise and when im going to register my fingerprints its just a questionmark. 3. I had it on Windows XP Home Edition 32bit so i know how to use the software. 4. I dont need the fingerprint reader for web using. Great! Installed on Windows 7 RC 7100 following you steps exactly as described. Thanxs! This explanation is brilliant and very helpful. Thanks a lot and many greetings from switzerland. I missed one of the DLLs when I changed the properties in the Bin folder, which meant that the reader lit up, but I couldn't register fingerprints. Went back and read the intrsuctions properly, took my time and spotted my mistake! All works perfectly now. Shame I can't claim the $40 rebate as I live in the UK. Has anyone got the reader to work for Firefox 3.6? Yeap! Got it working with firefox 3.6 and win7 rtm 7600 ultimate. Choose the latest beta version and follow the guide. It Works! blogfeld! you're amazing.!! Worked like a charm.! I cant get this working i use Win7HomePremium and i did the steps exactly as you said but i get an error wiht "DPConsol" saying "catastropic failure"
Thank you so much. There were passwords I just could not remember and you help in restoring them and this program. You are the GREATEST. Just wanted to drop you a line to thank you for the explanation regarding the Microsoft Fingerprint Reader - awsome! Not only it works, but - remarkably for IT tips and explanations - you wrote a beautiful piece, well-organized, clear and complete. Looking forward to finding more gems on your blog in the future. Thanks a lot! Great instructions. is there any possibility to find any driver for the microsoft fingerprint for windows 7 (64)?? I followed your instructions and it works perfectly now with Windows 7 - thanks. hey, i have an HP Laptop with a fingerprint reader built into it, but when it says plug the usb cable it doesn't realize that i already have a reader. is there a way to deal with this? Worked Like a charm. Thanks for the write-up! On the Microsoft fingerprint mouse, Win 7 32 bit new installation,I am getting closer. When I install from the modified program I get an error message of: Error 2356 could not locate cabinet in stream: DATA1.CAB. Then I have to stop the install. Because it doesn't install, I never make it to step 4. It worked me (same method that I was told use to make my old HP Scanjet 2200 to work actually), so I can log on in W7 but only if I was completely out. If I locked or wake up from sleep, it won't recognize my finger prints. I suspect that it has to do with credentials that I don't know how to manage. to register my fingerprints did not detect any fingerprint reader and I get a sign at the bottom right with a question mark. I tried to run the installer on my 64-bit machine (which has 32 bit Win7 installed, don't ask) and got the installer error "Installation cannot continue due to the following problem(s): - Windows XP 32 bit or Windows Vista 32 bit is required". So I fired up Orca again, and went to CustomAction > MsiCheckConditions and changed its name to "Dummy MsiCheckConditions" to disable all the install checks and it worked. Perhaps this will work on 64-bit machines as well? Thanks for the tutorial. Must buy you a beer some time. to register my fingerprints did not detect any fingerprint reader and I get a little sign at the bottom right with a question mark. I do all like in article and Finger registration process work great! But after reboot logon screen by Fingerprint wasn't work? I can login only with my password. My PC is member of microsoft domain system (AD). To keep this article well alive in 2010! My HIGH recomendations for this SUPER explanatory of the work around on Fingerprint Reader in Win7! First, thank you so much for the clear explanation. I will try your solution next week. I hope your blog isn't taken out too as I intent to return again to it in future. Now go back to the installer and click the Finish button. The installer will ask you to restart your computer, go ahead and allow it to restart Windows. and does not advance, how? Thank you for the information regarding the Microsoft Fingerprint Reader. Tried in vain to get it to work until I read yoor very clear instructios. Well Done !! None of the drivers work for the MS reader. Just did a clean install of Windows 7 64Bit and downloaded and installed from the link you posted and it works great for my Dell 1735 Fingerprint reader! Thanks Olly! Thanks a lot - there is not more to say. Is the Windows 7 logon is working with Microsoft Fingerprint Reader? Comments above say that there will be errors. Is that the cheat? How one gets Windows Login to work? (I have not tried). Thank you guy, your tutorial is perfect! Working perfect in Windows 7 Home Basic! Re-installation is complete following your guidance and the reader works perfectly. I’m truly amazed how you thought your way round the process, it was a minefield to me and I was about to bin the reader, installation disc and instruction book in frustration. I’m so thankful I stumbled across your website. Hi. Do you have a solution for Windows 7 - 64 bits? Thanks. Just wanted to say a huge thanks. Seams to be working perfectly. Wish Microsoft were as helpful as you. Many thanks, useful and easy post. This made my day! I hadn't touched the deamned device since i upgraded to W7 a year ago. Today i found your blog and the solution. Absolutely great! How can i fix error 2356 it is saying it cannot locate data1.cab. has anyone found the solution for windows 7 64 bit? well i know I'm a little behind times, but nevertheless...fingerprint reader keyboard is working just great for logging on to the computer but the logon manager doesn't work still. I get the error msg "The Password Manager Agent is not currently active. Please log off and back on again to correct this." Tried that, still doesn't work so I'm having a little difficulty in using the fingerprint reader for website logons. Any ideas? Other than this this was a superb article! Wow, thank you very much! It works! I have a question: I'm from Germany. Can I translate the tutorial and publish it on my blog? It would be help the users, who didn't speak English. It would be very nice ;-) Of course, I also write, that the tutorial from you is and that I've only translatet it. With link. 3. CLEAN the readers' surface with a 50%-or-less solution of isopropyl alcohol and wash your hands. And don't get indignant about the RTFM part; if both your OS AND your hands are clean, you just need to work on your reading comprehension. @nw - Übersetzung gerne erlaubt mit Verlinkung zum Original. Darf ich die Bildere eigentlich auch verwenden? Der Beitrag kann dann unter niggonet.de.vu angesehen werden. @nw - Ja, Bilder gehen auch. Ich kann schon Deutsch, habe aber keine Zeit zum übersetzen, also danke dafür. Anyone get an invalid password after putting in your windows password when you run the fingerprint manager for the first time? Even though the password is right? I used the guide lines by line and it worked perfectly for me, nothing more nothing less, the guide is absolutely perfect and I have my Fingerprint Keyboard working now. Thank you Thank you thank you. I cant believe I just accepted the Microsoft compatibility message without googling for it. Thank you very much, this solution works great!! fu ms for not supporting the hardware you sell to go with the software you sell to you help out your dedicated users/followers. Here i come Redhat! I had it working per blogfeld instructions but then I had a problem and had to reload everything and now I can't get it to work. 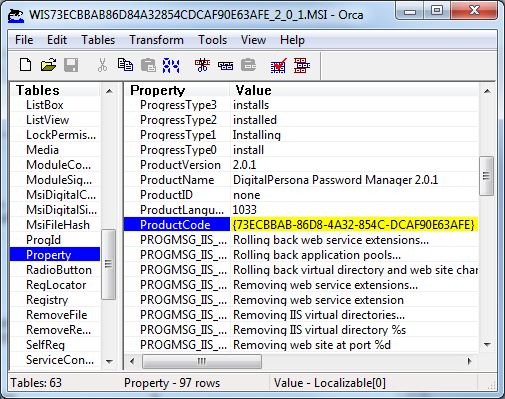 The orca download has no tables in the program when opened. I have tried 6 times now still no tables to selesc from. Well I've followed the instructions perfectly and did get the program to install all the way up to the part of registering a fingerprint, I follow the programs instructions but it doesn't want to register a finger, instead it continues to give me an error and asks for permission to run DPConsol Module, I click yes and nothing happens. Could this be an error on my part or the device itself? The thing is, I have the software all working and running. It's great, but I can't use it because the web logon detecter doesn't work. Would this be because XP and Windows 7 logon scripts are different, or what? Can you please tell me how to fix this problem? Thanks for the instructions! I am using Windows 7 Enterprise SP1 32bit and can register fingerprints without problems and use them with the DigitalPersona software. But the main problem is: I can't use the fingerprint reader to logon to Windows 7! Did anybody managed to get it working? this works which Internet Explore? Logging is is required to download files. I'm not able to install orca, it says something with administrator privileges, same for instEd. Can you please let me know how can I solve this? Hei Man, Was very helpfull, here working perfectly in win7 32 ultimate! Thank you for share the solution, nice job! Thanks.. i just ressurected an old keyboard and it works great.. Thanks for this! Works great for IE9 but I get "This page is not a logon screen" when trying to create a logon in Firefox (16.0.2) and chrome (23.0.1271.91 m). Has anyone had success with browsers other than IE? Hi Robbie, I have had some success testing with Windows 8 and hope to post follow-up instructions in the coming weeks. Stay tuned. Hi, it worked great, thanks for the info. I followed instructions exactly as posted and it works pretty good with windows 8, MS no longer gives refunds unless still under warranty, which is impossible since this unit has not been sold for years!! Gives me an error 1723 when I run the modified MSI in Windows 8 Pro. will this work if i am running a legit version of windows 7 enterprise ? Thank you, just install and test the windows 8 and is working perfectly, follow every step you said here and everything went OK. Many thanks and congratulations. Muito obrigado, acabei de instalar e testar no Windows 8 e esta funcionando perfeitamente, segui cada passo que você diz aqui e correu tudo OK. Muito obrigado e parabéns. Followed your instruction very carefully and all went well to the reboot. When windows restarted 70% of my desktop icons had gone as well as 1/3 of my programmes. Anti-viruses were 100 days+ out of date, even firefox had dissapeared completely... Desktop wallpaper had been changed and multiple other issues.. In desperation I had to use a restore point from some weeks ago in order to get everything back. Fortunately my pc is now 90% back to the way it was. So, a word of caution might not go amiss here for those about to try this.. Though it did get the fingerprint reader working and it seems to work for a heck of a lot of people it would be a good idea to set a restore point before installing orca then if you do encounter my problems (and they may just be unique to me) you will lose nothing.. Oh and if you do have to use restore, remember to disable your Anti Virus first..
Windows 7 32 + 64 bit drivers and patched software. Thanks - that worked perfectly, with one small adjustment to the instructions. I couldn't edit the MSI file in Orca while it was in the C:\Program Files\Common Files\Wise Installation Wizard folder. I had to copy it to the desktop, edit it there, and copy back. "please wait while the fingerprint is been enabled"
what can i do please...thanks for the post? I can verify that http://teknogods.com:8081/phpbb/viewtopic.php?f=49&t=8653 works well for Windows 7 x64. Thanks for keeping this post updated with current info. I first used this when I upgraded to Windows 7 x86 a few years back (and I did get Microsoft to reimburse me for my reader). I re-exhumed my old Natural Keyboard to use with a Laptop with W7-64bit and I was going to try and modify the files. That’s a Awesome blog ,We can provide a best services of you problem , any time you can call my help desk number and solve your problem just go through this url. Help I am trying to install my fingerprint reader on my Dell Desktop, running Windows 7 Home Premium 32 Bit. I keep getting and Error code 2356. Could not locate cabinet in stream: Data1.cab. I have tried several time from the start and keep getting the same message and I can not get past the coping new files. Can anyone help. I have done this on another computer and went right through each step without a problem so I am lost now. Thanks for any and all help. In the Map Options of Explorer, tab View, you have to show the secured system files and/or the normally hided files, folders and stations. After all, it's works perfect. Thank you. I have a problem i did all the steps but in the middle of setup, setup asked me for "plug the usb connector for ur finger print device" but i m using a dell xps m1330 laptop & the finger print is a part of it how can i jump over this step?? Works for me on Win7ProSP1. But when waking up from sleep or hibernate it reports "Unknown username or password". This is strange, because when starting the computer normally (from shutdown or reboot), I can login with the fingerprint normally. Man All i wanna say that you are awesome even if someone else came up with steps witch ofcourse brilliant from him thanks to you and to everybody helped getting these great solution to us . Hi, thanks for your incredible effort, i have learned something new but I need some extra assistance. I could get it working as far as logging into windows and saving my prints but on tryng to create logons for websites it is failing to recognize websites logon screens. Have tried all i came up with but with no resuts. youtube, OneNote, live, Google, Microsoft, nothing Works, it does not recognize logon screen without passwords and usernames and neither with them. Cannot create ohter logons than just Windows login. I am using win 7 ultimate 32bit new install and have followed all your steps. When I run the final application to set up my fingerprint, it says "Error. Access is denied. Suspect instillation problem" HELP! Just a simple thank you for this article. Used it to install Lync on my demo environment and it works like a charm! Dear sir very good and informative artical. H does this work on windows 10 32/64 bit?